So. Lately I've been obsessed with bath bombs. Don't know why. But I am. If you scroll down a bit you will see that I attempted to make some a few years ago. That was very difficult because they kept falling apart. But after about 30 broken ones, I finally got a few good ones and my kiddos enjoyed them in the tub! 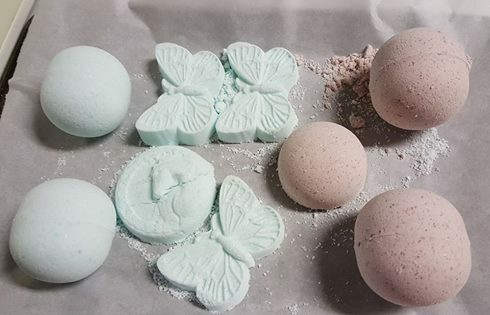 So, now I am going to get my recipe out, and try my hand at these bath bombs again! I hope so much that I can figure it out! I will do this in the morning. Fingers crossed. I will add pics if they go well!